Orion has made huge progress physically. He is sitting up with less and less support. When he is not trying to lay down in his favorite position, he accepts people holding him at his hips for sitting on the floor. And only last night, I took my hands away from his hips and he stay seated for 1, maybe 2 seconds before toppling over sideways! I learned that children like Orion feel more secure with their body in contact with something. There is contact from head to feet while laying on the floor. 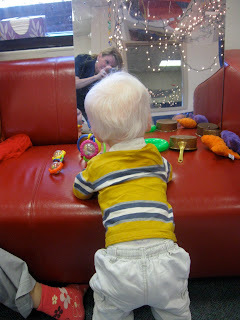 When sitting, there is less contact, with his bottom, legs, feet and maybe hands if he's propping himself up with them. 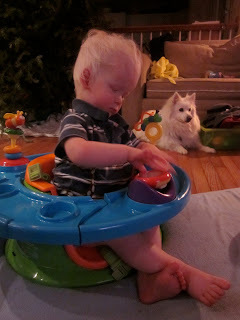 January 3, 2012: Orion sitting up in the pseudoBumbo (5 minutes) Falkor is glaring at Katra outside the frame. 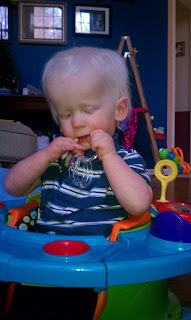 January 14, 2012: Orion's having so much fun with a-buck-something shower curtain rings. I bought them for a different project for Orion and here he has other plans. Love it! After 2 weeks of sitting sessions in this seat (company: Summer's Infant), Orion has accomplished 20 minutes of sitting. We are seeing an increase in Orion lifting his arms sideways when he's had enough sitting in the seat or highchair. We saw it clearly during a Prince George's County Infants and Toddlers home visit on January 12th. Up to this point and we still continue to sign "FINISH" and/or lift his upper arms right before we pick him up. We particularly did the latter to teach him the gesture for "pick me up", or "done", since this is usually learned visually. Orion knows the spoon very well as he's been eating off it for almost a year now. In April 2011, right after Thomas' retina detachment/vitrectomy, Orion's Uncle stuck the spoon in his hand, already near his mouth. Orion pulled it to his mouth. That was the feeding mode between Orion and Uncle while mine was tapping his cheek and Dad's was a pat on his chest. I have occasionally put the spoon in his hand, only touching the palm and no holding his wrist or hand with my other hand, he'd either quickly put it in his mouth or withdraw his hand. Apparently Orion did not realize he can or should do it under his own power until recently. He's been eating with his hands and other times when it's jarred baby food, it's off the spoon. After enjoying reviewing Perkins' webcasts, especially one by Barbara Miles, I realized the practice of teaching/showing him things using hand-under-hand method had faded away from me. So I got proactive late last week and I would say during his 2nd session at the highchair, he picked up the spoon off the tray. (The spoon has always been pre-loaded with food.) I've always thought he was awesome but he still surprises me from time to time. Um, maybe Orion was just waiting for Mom to finally show him? On Sunday night, Skyler wanted to give Orion crackers. I told Skyler to tap the back of Orion's hand and give him the cracker underneath to the palm of his hand. Orion took over from there and Skyler was thrilled. Skyler declared he will from now on sit with Orion and feed him. Skyler loves to get a little rough tickling his little brother or lay down and fall asleep next to him if he's on the soft mat in the TV room. I'm glad Skyler had this feeding experience to increase his bond with his little brother, a different kind of interaction where Orion has better participation in than being tickled silly. We'll continue with Orion using his hands to pick up food along with his new-found skill in picking up the spoon and then somehow teach him how to load his spoon using hand-under-hand. Lori, his occupational therapist at Kendall School, recommended mashed potatoes. They stay on the spoon well. Perfect! Orion enjoys the mashed sweet potato I occasionally nuke in the microwave for him. Orion and family was invited via CBSS to Fantasy Flight 2011. This was an annual project of Children's Hospice International and United Airlines at Dulles airport. There was clearly a lot of thought, effort, love and time put in this magical event. We arrived at Dulles early the morning of December 10. They went all out, Christmas style from picking up boarding passes all the way to the end of the party after arriving at North Pole. I was so happy to see Christmas spirit, full throttle. We went through security like any other trip, there was face-painting and donuts, fruit and drinks at the boarding gate. Glittering garlands draped the interior of the plane, signage was covered in wrapping paper, jolly flight attendants were donned in antlers, bells or Santa red. This flight attendant was having so much fun! Skyler and Tasia enjoy chocolate covered Peeps. Orion and his new friend. We love Mr. Grinch! He was smiling and then when I(Mom) took this picture, Grinch quickly assumed his role by pouting! We were able to convince Skyler to pose with the gorgeous Redskins cheerleaders. Holy moley and I thought I had a big head! There were apparent challenges for the antlered or hat-wearing flight attendants while on putting the inflatable yellow life vest during the pre-flight safety instruction. We then took off into the sky. Attendants pulled down all the window shades. My Sky opened his again but luckily the plane was turning left and all he saw was pretty blue sky. But later he kept opening and shutting it as I covered Tasia's eyes the best I could as she also pried my fingers off. Orion was busy sawing a sequoia log in Thomas' arms. The flight was around 30 minutes long. 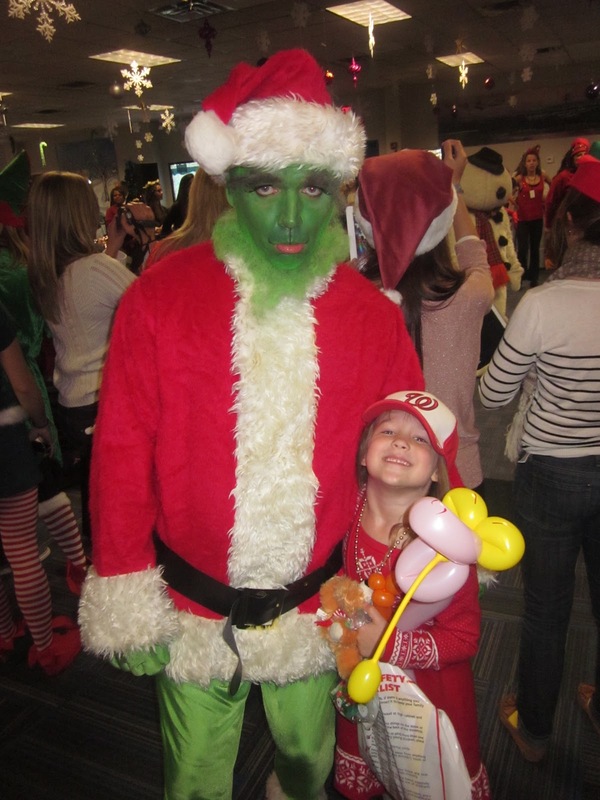 After landing, we came out of the jetway into North Pole with cheerleaders, Nationals mascots, princesses, elves, families, friends, etc. There were a lot of things going on... music, food, booths, night vision and infrared goggle demonstrations, people passing around goodies. Santa and Mrs. Claus came in to have pictures. Orion was nearly all the way through his sequoia log as he was handed over to Mrs. Claus and the Big Claus himself. Santa had gifts for every kid in attendance. Have you seen the pages of a Where's Waldo book? This is what the jolly festivities reminded me of. Our neighbor said it would happen: we were touched. Orion finished his log and had some yummy food before we left. We conceded to the kids that it wasn't really the North Pole. The real Santa Claus and North Pole was still so far away from us. To know that there are people out there who give selflessly to enrich the lives of children is touching, comforting and inspiring. Thank you so much. Also, you've probably heard/seen it enough from fellow humans, but.. best wishes for a joyous 2012!